This was my first time testing out what could I do with the mascara brush and it turned out pretty cool (I think)! 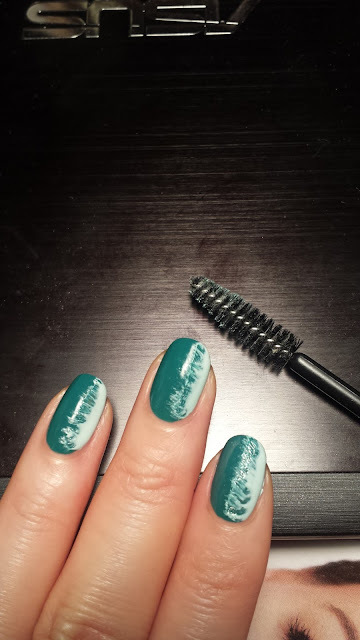 I have a few of these disposable mascara wands laying around and decided to give this side-way gradient nailart a go. First, I planned out the colors I wanted to use. 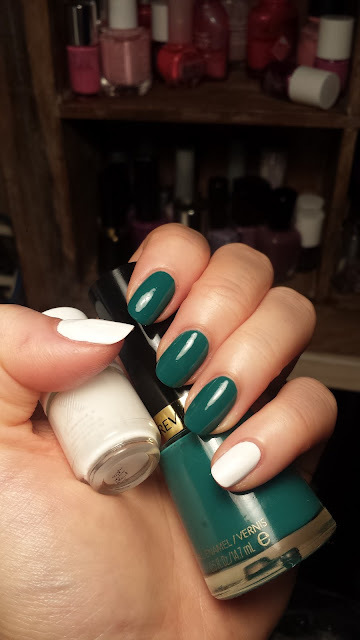 I took out 3 shades of green and painted the mid-toned one all over the nail for a solid base color. This green is by Revlon from their classic line of polish and I always knew they have great quality and very easy to apply to get a nice even color. This was with 2 coats. 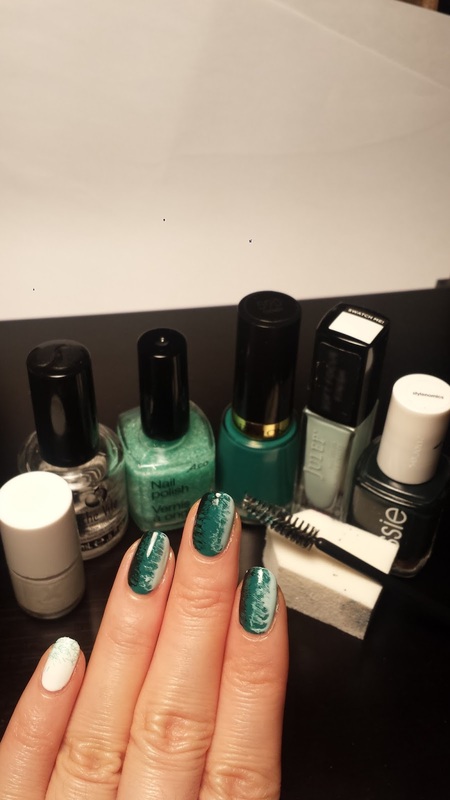 Then I used the light shade green by Julep and painted a stroke on one side of the nail. While this was still wet, I took the mascara wand and lightly drag the polish side way towards the center. I only dragged part of the polish, while I didn't touch or mess up the polish at the side edge of the nail. I repeated this with the darker green by Essie (it's almost a black) on the other side of the nail. 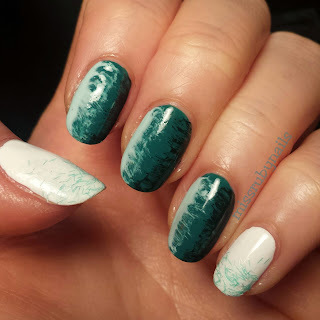 For the 2 white nails I simply sponged on some mint green glitter to match the color theme! 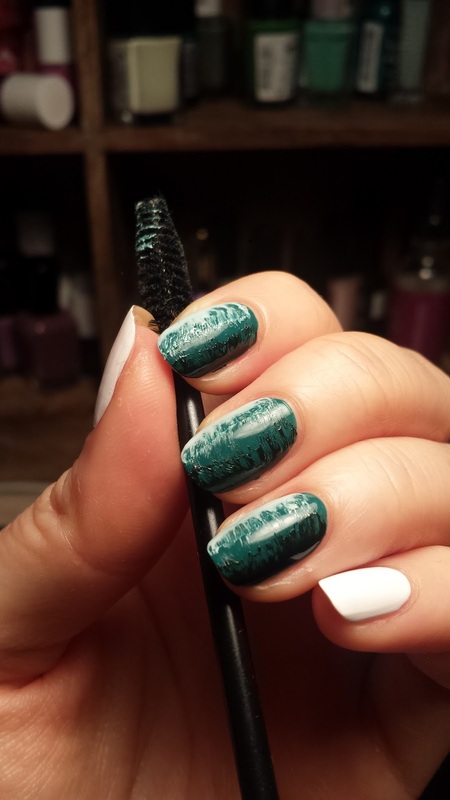 Use opaque polishes for the mascara brushing as you are expecting to use only 1 coat of them. Use a light hand for the brushing and only brush the very edge of the polish while leaving a good solid color on the side of the nail, to achieve the gradient look. Brushing can be done in a few strokes, so keep brushing until you are happy with the look. Brush with lighter color first, so you can use the same mascara wand for the darker color while it's dried again. Try this out and have fun!